A list of stakeholders must be compiled to effectively manage stakeholders. A good way to do this is to create a visual map. Put the main system in the centre and the main components of the system around it. For each main component define the roles, like the business owner, the user, external parties, and the system manager. Then define the actual persons working in these roles. When the stakeholder landscape is clear, a list of the stakeholders can created. All stakeholders are categorized based on their interest to the project and the influence they have on the success of the project. Most project leads to changes in both the IT landscape and (often) the business processes and therefore to concerns of the stakeholders. For every stakeholder their concerns are weighted and given a number between between one and three. This number is called interest. One is low interest for this stakeholder. An interest of three shows a the project brings many, or complex changes to the stakeholder. Some stakeholders have more influence on the project than others. This influence is also ranked between one and three. One means the stakeholder is considered to have very little influence on the project or the solution being built. An influence of three means the stakeholder has much power to resist or support the project or solution. Based on the ranking for all concerns, an average is calculated per stakeholder. In this stage noth the interest and the influence are ranked either high or low per stakeholder.Communication planWhen the stakeholders are ranked, they are caracterised using the following stakeholder map. Low interest, low influence Occasionally Contact These are relatively unimportant stakeholders, but keeping in touch with them is a good idea, just in case their status changes. High interest, low influence Keep Informed These stakeholders are easy to ignore as they apparently cannot derail the project, although if sufficiently upset they may gain influence by low-level blocking and other techniques of resistance to the project. Do remember that minorities can be very powerful, particularly if they work together or if they get powerful allies. 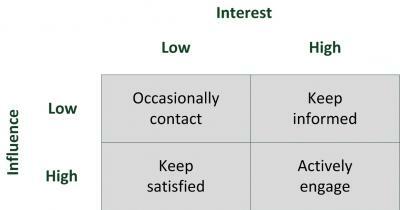 Low interest, high influence Keep Satisfied Stakeholders with a low interest in the project will not be particularly worried it, so are not too much of a problem in the actual project. A problem can appear when they are persuaded to act for those who oppose the project. It is thus important to keep them satiesfied, for example with regular meetings that explain what is happening. High interest, high influence Actively Engage These stakeholders are both significantly affected by the project and most able to do something about it, either by supporting or by opposing the project. It is particularly important to engage these stakeholders in the project, ensuring that they understand what is going on and also to create buy-in as they feel a sense of ownership of what is being done. Based on the classification of the stakeholders a communication plan must be created. In the communications plan the stakeholders and the frequency and type of contact per stakeholder are listed. This way it is ensured that the stakeholders get the attention they need and deserve. At the beginning of the project individual interviews should be held by the architect and the relevant project members with the high interest, high influence stakeholders. This opens up communication channels between the architects and the most important stakeholders, enabling smooth communications in the future. In the interviews the interests of the stakeholders are discussed and arrangements are made about the frequency and form of future communications. It is always a good idea to have the follow-up stakeholder discussions with multiple stakeholders in one room. This not only saves time for the project team, but also opens up communications between the stakeholders about the project. It is not unusual that the stakeholders never exchangeds ideas and concerns amongst each other. In such a setting conflicting concerns can often be cleared up easy and early. It is important for the architect to address all stakeholders’ concerns, even if it means that concerns might not be mitigated. Addressing the concerns of all stakeholders must be done during the full project life cycle, as during the project new concerns will arise. This is perfectly normal as all stakeholders get more insight in the results of the project and as business continues to move forward during the project's life span. These new concerns must be handled in the same way as the original concerns. Typically, only when the stakeholders feel their concerns are taken care of and get serious attention, they are willing to support the project.